GameSurge has started a extensive gallery section for Computer games. With a selection of multiple games found in the gallery section, you will find screenshots, images, and artwork for some of the hottest computer games out there. The new Jupiter system shows it's power in the upcoming game NOLF2. Jupiter delivers an even broader range of features including a new polygrid system that supports dynamic lighting, Fresnel reflections and dynamic surface animations as well as the addition of cubic environment mapping. Other new features include an improved command editor to more easily create cinematic events and more robust support for dynamic texture effects. This unique software is great for model railroaders as well as any train sim fan! Build your own layouts, collect your own trains and ride them too! The Game-play combines elements of high-speed air racing with true dog fighting and a great tactical challenge. Amazing 3D graphics and positional sound effects together with very authentic physics create the perfect setting. The intense matches take place in astonishing landscapes inspired by famous locations around the globe. JoWood Software is set to release this state of the art RTS sometime in early 2001. It looks great! Blizzard is set to release WarCraft 3, the next in the line of the widely successful Real Time Strategy game, sometime in the year 2001. We have some new E3 2001 pictures for you to look at. We are constantly updating this section as more pictures are released. 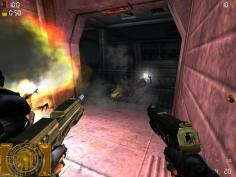 Some games are written so that players can get the games themselves to run faster and more smoother. GameSurge has a couple of guides just so you can get that last bit of juice out of your system. Not only can you find some great tweaks, but there's a summon list and a small group of cheats included! A must visit for all you unreal players out there. Need some help looking for information on your graphics or Sound card? Here's a great place to find the information you need, fast. The top games get the royal treatment, with dedicated sections for each game. Due to the massive change over, none of the sections are presently up, as they have to be redone in the new format. What's a guy to do when his dog eats his instruction manual? You could spend hours trying to figure the game out yourself, and more than likely miss something, or you can peruse our text format manuals list. Find out more about the people behind your favorite game. This section talks with some of the most respected programers, artists and MOD developers, about their past, what they are working on now, and their future projects. The Computer Review section is now up and converted to the new format. Find out all the information on the latest, and hottest computer games, with honest opinions written by honest people. Supreme Commander: Forged Alliance is the sequel/standalone expansion to the RTS Supreme Commander. 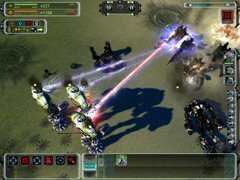 "The Supreme Commander universe is based on the �Epic� premise � think of a typical RTS game and multiply the map size by 5 to 10. 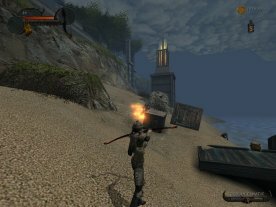 In fact, there is no minimap for the game; instead the entire playable area can be zoomed out so that you end up with a full screen �minimap� where units and buildings are reduced to coloured pixels." 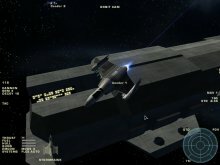 Starshatter is a fresh addition into the space sim genre. "While it is far from flashy, it still holds certain entertainment value from the innovative game design including missions from direct combat to larger scale strategic fighting. " Enclave is a fantasy based 1st/3rd person 3D Action game, recently ported over from the Xbox. "Aside from a fairly standard good vs. evil plot, Enclave sets itself out as a fairly unique 3D action game, with RPG elements blended into it. " Icewind Dale 2 is the sequel to Icewind Dale, and one of several RPGs developed by Black Isle Studios following the D&D rules. "Icewind Dale 2 has not offered any groundbreaking innovations or improvements to the genre. Instead they have taken from a proven track record from many previous games and expansion packs to provide gamers with another opportunity to enter a mystical world in a quest to prove themselves as heroes." "AvP2: Primal Hunt will have you fully immersed into intense and deadly battles early on in the game, which helps to make up for the short gameplay time. For example; in the human campaign, you will have access to the entire weapon arsenal after about 15 minutes into the game." Having some problems getting past that level boss, or missing that key item in a RPG? We have got a extensive new section started, for ALL computers, young and old.